It was the day that the watch industry had been waiting for. 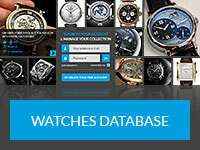 Around the world, many of those involved in the world of watches had set down their tools and cleared a space in their diary. The anticipation had been building for weeks, but when it came it was like a bolt out of the blue and straightaway keyboards were being pounded, and the chitter-chatter cut a swathe through social media channels. 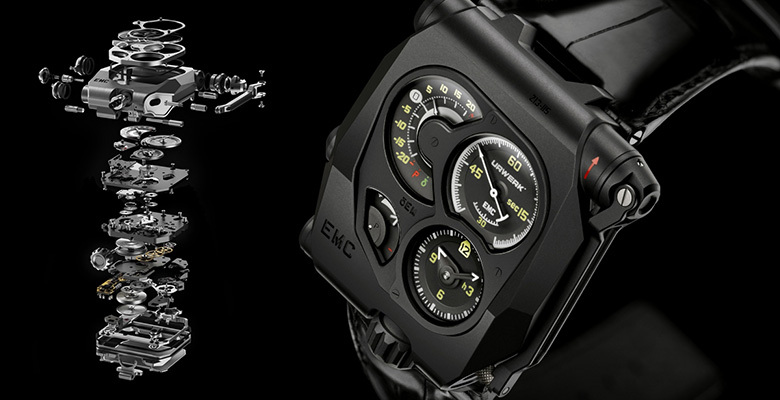 Yes, the new EMC Black from Urwerk had arrived. And U2 gave away their new album for free. 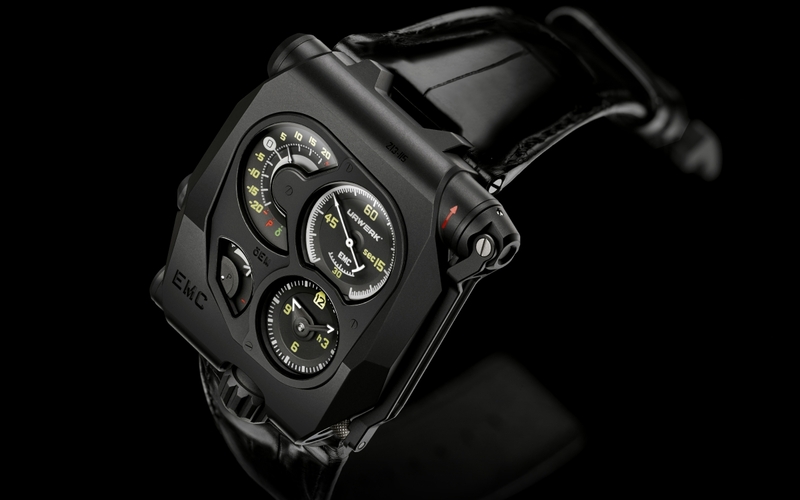 Urwerk EMC Black – Beat That Cupertino ! The Urwerk EMC comes with a novel new development – its fifty-five piece production is available only in black ! Unlike Apple’s headline grabber today, its case is not as smooth as a pebble with an intangible seam where sapphire crystal meets case. Where the crown would normally be found on the side of the case is a long lever with a strange crank-like action. No, forget about flush joins and smooth surfaces. Instead it is a bold and angular chunk of asymmetrical stainless steel and titanium with the displays scattered unevenly upon the front of the watch and odd-looking appendages fixed on to its sides. Fair enough, the Urwerk EMC (for Electro Mechanical Control) itself is not completely new, having appeared just over a year ago in April 2013, but in terms of marrying watchmaking and technology the Urwerk EMC did set down new rules of play, for as well as being a device for telling the time of day with a fully in-house designed and manufactured manual winding mechanical heart, it also saw the world’s first onboard electronic accuracy deviation monitor. This tiny electronic device takes its data feed from an optical sensor which detects the pace of the almost solid balance wheel, and then that reading is displayed on a scale in the little dial at the ’10 o’clock’ as a plus or minus, with zero representing a loss or gain of 0 seconds per day. As well as being able to display the rate of accuracy, another crown operated fine-tuning mechanism provides the means to recalibrate the rate whilst on-the-move, by adjusting the active length of the balance spring and thus adjusting the rate to over/under compensate should the watch be running slow or fast, depending on the forces it is being subjected to while on the wrist. Apart from this rate display, the small seconds – because don’t forget, this is a watch after all – has its own dial on the upper right of the face, with the hours and minutes directly below. Beside that, to the left is a small window through which the power reserve is on show. The four dials are assembled in a multi-part dashboard-esque cluster with each one isolated from its neighbour, which serves to highlight each in its own right and the effect is always captivating and interesting, meaning that one could lose oneself briefly while simply checking the time. Turned over and the sapphire crystal caseback reveals the Urwerk EMC’s square in house manual winding movement, with côtes de Genève contrasting with grey microbilled surfaces of the various bridges. 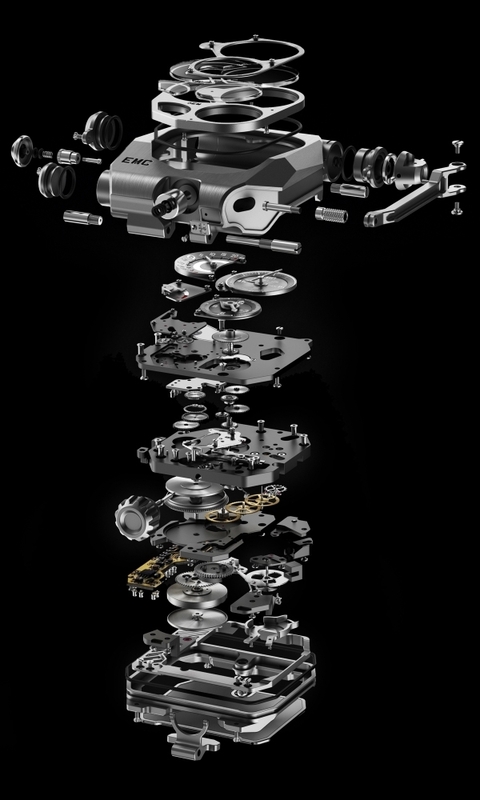 Bearing in mind that nothing much here is conventional, there is for example no busy balance wheel to look at, as Urwerk’s disc-like reinvention is hidden beneath a calliper-like cover which houses the EMC’s optical sensor, so it can feed back the electronically harvested data used to constantly monitor the movement’s accuracy.